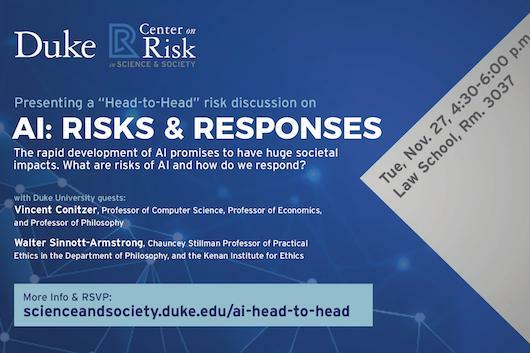 The Duke Center on Risk in Science & Society is sponsoring a series of "Head-to-Head" talks to explore the value of considering complex, contemporary risks from multiple perspectives. In this session we address AI: Risks & Responses. The rapid development of artificial intelligence promises to have huge societal impacts. It could help to solve multiple challenges in health care and disease, energy and climate change, data analysis, and poverty, in addition to changing the consumer experience. At the same time there are potentially profoundly negative ramifications of AI and its effects on the power of the surveillance state, democratic processes, employment and worker displacement, and indeed the very nature of what it means to be human. What are risks of AI and how do we respond? We'll have a moderated discussion with two scholars at Duke to think about these issues. Drinks and hors d'oeuvres will be provided. RSVP to https://scienceandsociety.duke.edu/ai-head-to-head to reserve your spot.